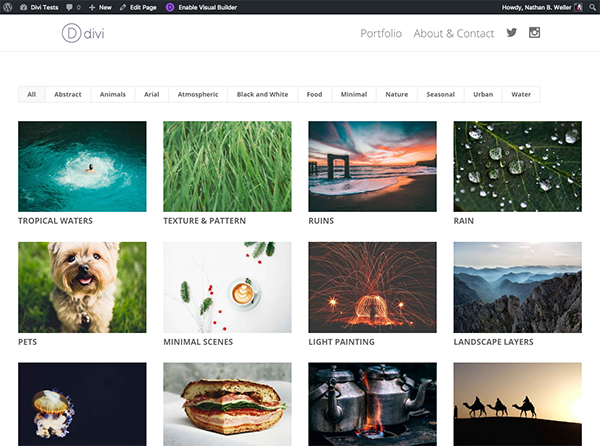 Welcome to post 2 of 5 in our miniseries How to Create a Simple and Effective Portfolio Website with Divi. 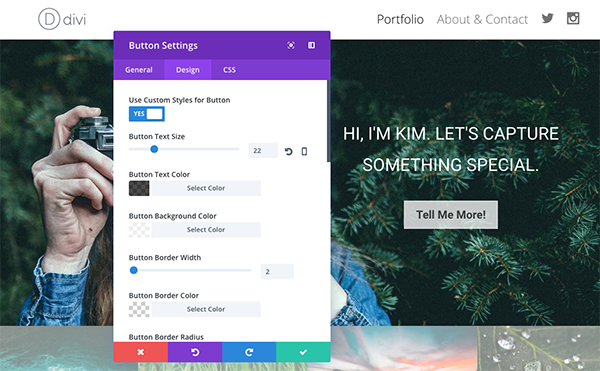 In this series we’ll cover everything you need to do in order to create your own portfolio website from scratch. We’ll also go over how to use our A/B testing system Divi Leads to make sure your site is effective at attracting new clients. 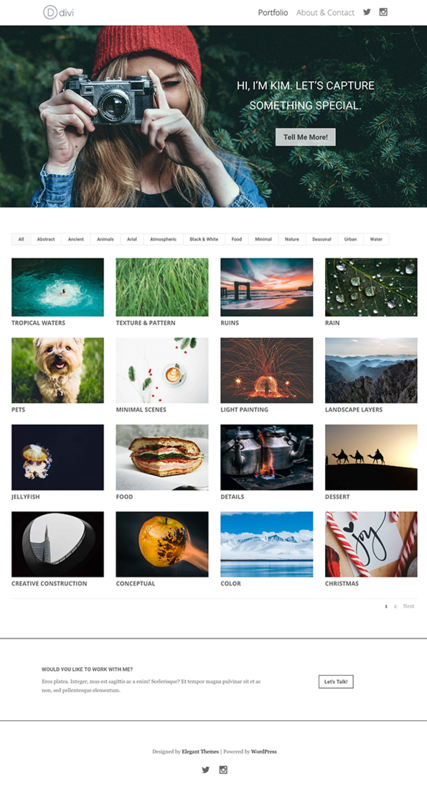 In today’s post I’m going to show you how to add some alternate styles to the minimal portfolio homepage we built in yesterday’s blog post. 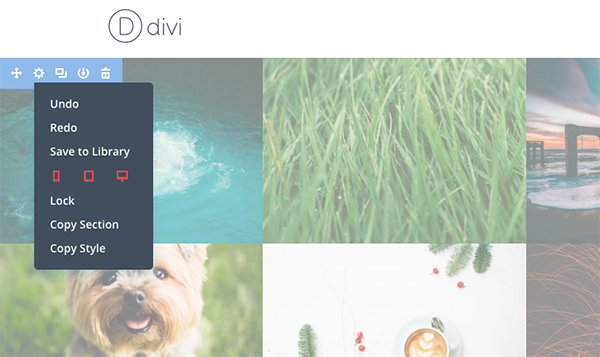 My goal is to provide a few simple additions and alternatives that we can test later using Divi’s A/B testing system Divi Leads. 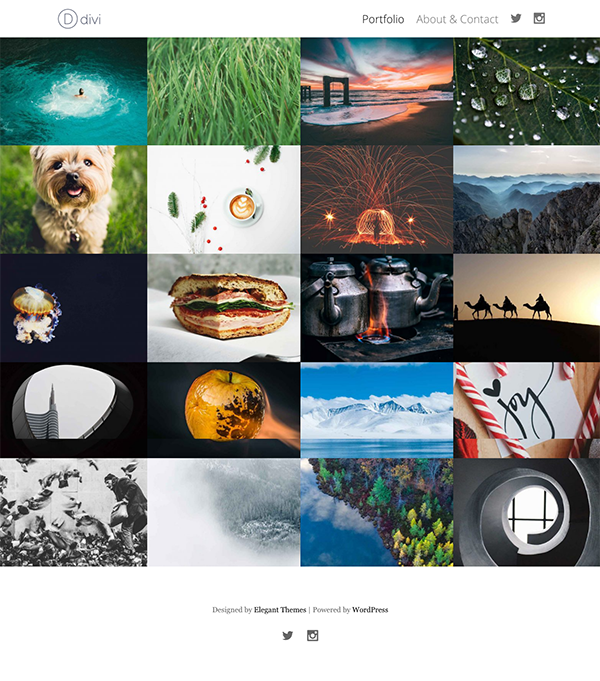 In yesterday’s post I showed you how to create the minimal portfolio homepage above. We’re using that as our jumping off point for today’s design variations below. If you’d like to follow along and haven’t done the first tutorial in this series yet, follow this link and give it a go so you can come back here and try out these fun additions. In keeping with our minimal aesthetic I thought adding a black and white call to action at the bottom above the footer might be a nice touch. Or, at the very least, something to test and see if it increases the number of people who get in touch via the contact page. Create a standard section with a single row and two columns (2/3 and 1/3). In the 2/3 column on the left create two text modules, one on top of the other. 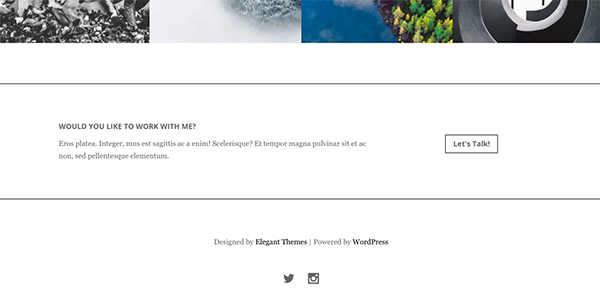 In the top text module I’ve placed the words, “Would you like to work with me?” And in the second text module I’ve put a line of sample text. In the 1/3 column on the right place a single button module. For the button text I’ve written, “Let’s Talk!” But you can write whatever feels appropriate for you. Now that all of our content is in place, let’s style it to fit our design. This will result in a top and bottom border like the image above. Save your changes. It should now look like the image above. Open up the button module settings and do the following under each respective tab. Set your button URL to your about/contact page. 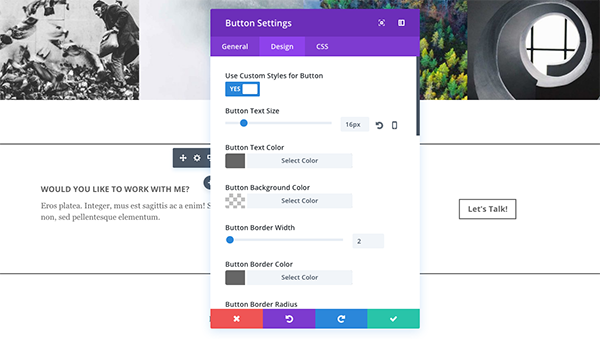 Flip the switch for “Use Custom Styles for Button”. Paste the following under Main Element. Save changes. Your button should now look like the image above. Now that all of your changes are made the new call to action should look like the image above. In the sections below we’ll continue to build off of this initial variant to create a couple more full page designs. 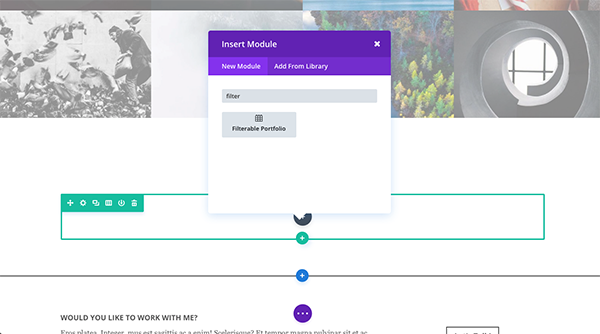 For our second variant we’re going to swap out our standard portfolio module for the filterable portfolio module to make browsing by category easier. But we don’t want to delete or do away with all our hard work so far. So the first step here is going to be disabling the standard portfolio module. To do that simply enable the visual builder and right click on the blue section controls in the top left-hand corner. Click “disable” and select all devices. You’ll notice that the section becomes slightly transparent/dull. This indicates it is disabled and will disappear from view when you exit the visual builder. Now scroll down to the bottom of the section and use the blue button to add another section. 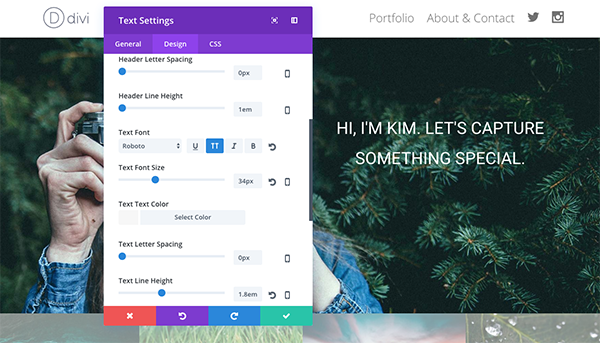 Select the single column layout and add the Filterable Portfolio Module. Configure the following settings for each tab of the filterable portfolio module. 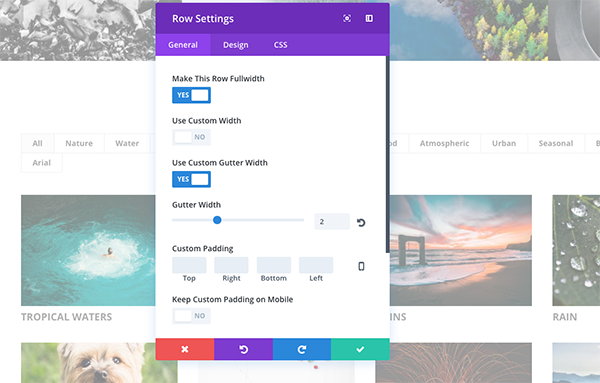 Now we need to adjust the row settings in order to make the filterable portfolio fullwidth. To do this open up the row settings and configure the following settings. 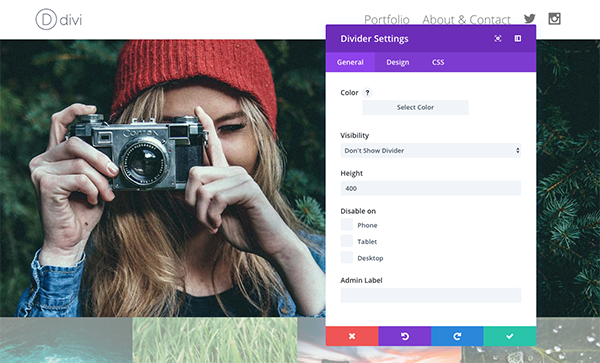 After you save and exit the visual builder your new filterable portfolio should look like the image above. 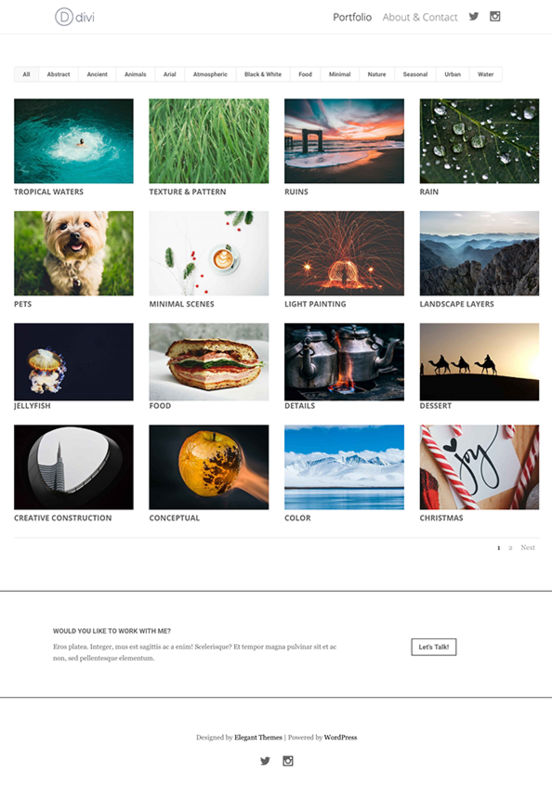 This updated design ads a bit of clean white space to the overall design and makes browsing your work by category much easier. Just as we did with our last variant, this one will build off of the others to create a final full page layout that contains all of the variants in one. To put the final touch on this new full page layout we need to add a hero section. Here’s what you do. 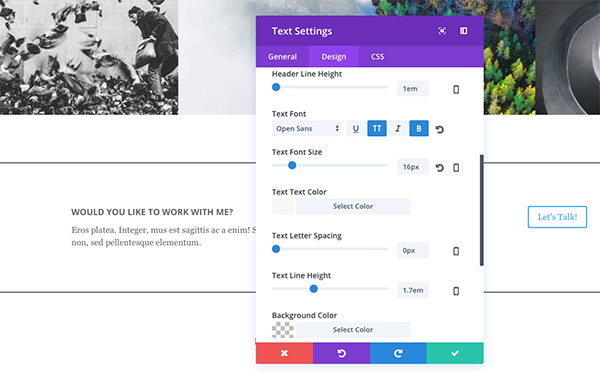 To get started add a new section with two columns and drag it to the top of your page. Upload a background image that is 1920px wide by 875px high and click the green save button. In the left-hand column insert a divider module and set the height to 400. Click the green save button. In the right-hand column insert a text module and do the following. In the custom css tab, under Main Element, paste the following line of code. 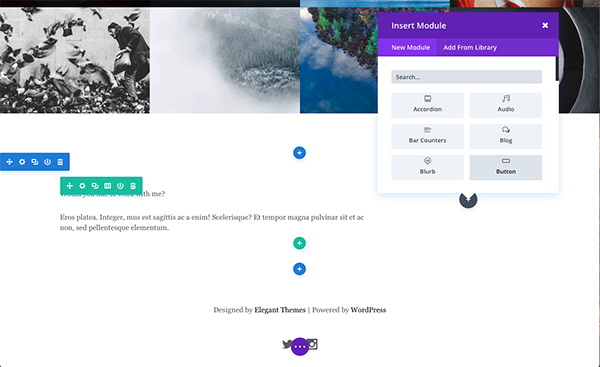 Insert a button module below the text module you just created and configure it according to the settings below. Button URL: Set to your about/contact page. 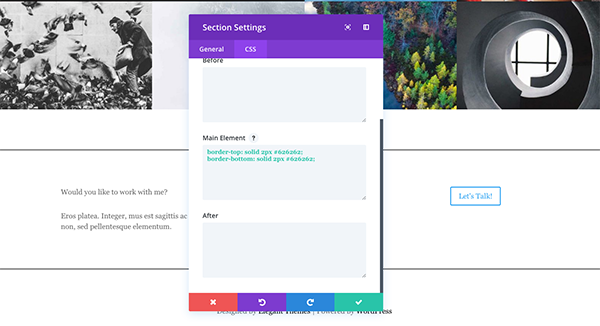 Once you’ve saved all changes and exited the visual builder your new hero section will look like this. 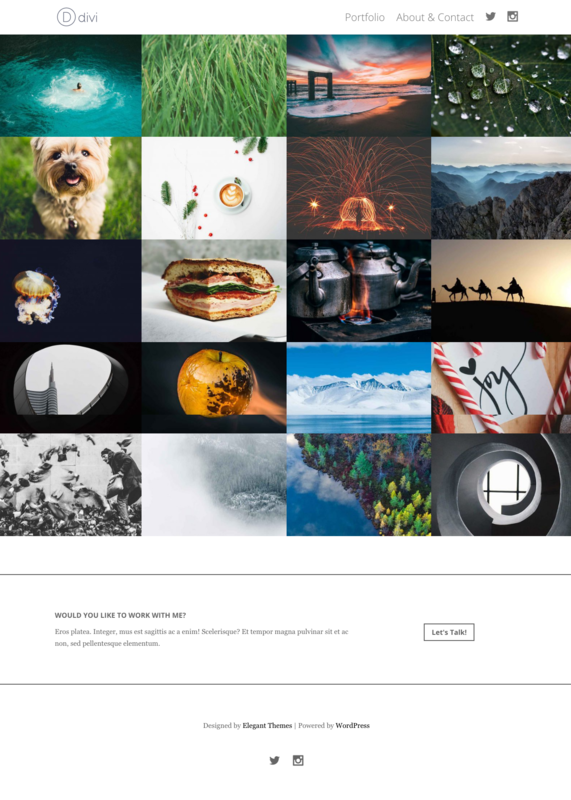 And the entire page will now look like the image at the top of this variant section: starting with a hero image, then a filterable portfolio, and finally a minimal call to action. 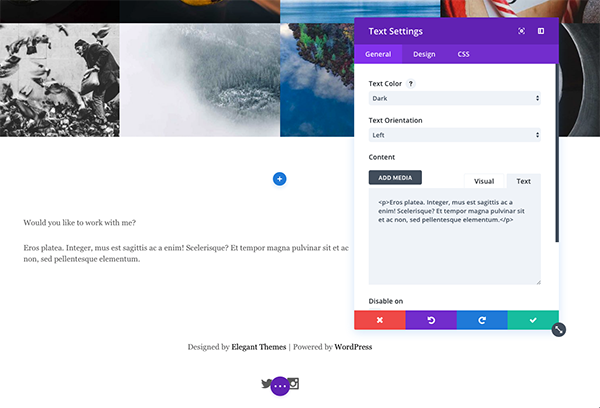 Later in the series I’ll show you how to test these design elements so you can come to a definitive conclusion on what works best for you and your visitors. In tomorrow’s post I’ll be sharing design tips and principles to apply to your portfolio project pages–as well as giving away a few free layouts to help you on your way! Don’t miss it! Looks pretty good, Nathan. It’s simple, but very elegant and functional. I am really enjoying these daily bits of inspiration! Please keep these tutorials coming!